Here's the teaser that premiered last night and revealed Batman - A Telltale Games Series. Official title and specific platform details are yet to be announced but we know it's coming for PC and home consoles next year. 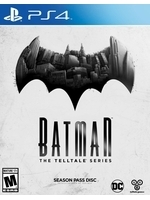 SAN RAFAEL, Calif., Dec. 4, 2015 -- Leading developer and publisher of digital entertainment, Telltale Games, with Warner Bros. Interactive Entertainment and DC Entertainment, today announced an interactive episodic game series based onDC Comics' iconic Batman™ that is set to premiere in 2016. The official title for the Telltale series is yet to be revealed. The episodic game series will premiere digitally on home consoles, PC/Mac, and mobile devices. Specific platform details are yet to be announced. "At Telltale, we've been honored to bring our unique approach to interactive storytelling to some of the biggest entertainment franchises in the world, and we're excited to announce that we'll soon be exploring what it means to be Batman in an all-new series starting next year," said Kevin Bruner, Co-Founder and CEO of Telltale Games. "This iteration of Batman will give fans a first-hand opportunity to dive deeper into the complex life and mind of Bruce Wayne, the duality of his own identity, and the struggle of responsibility in saving a city overcome with corruption and villainy." "Telltale has an established track record of creating award-winning content for some of the best properties in the world," said David Haddad, President, Warner Bros. Interactive Entertainment. "We look forward to working with the team as they deliver a new interactive way for fans and gamers to experience the rich narrative world of Batman." Oh mon dieu cette hype !! Telltale kind of lost me with their HORRIBLE season 1 of Game of Thrones. They made every choice you made that season pointless. Will Kevin Conroy be a part of this?